The new Star Trek movie boldly goes to a whole new level of SciFi Awesomeness! "Spock, do you think I should be the new Priceline Negotiator, too?" How good is the new Star Trek movie? So good that they should let this one be the final one in the franchise. No more movies. Stop with all the different series. Don’t let William Shatner write another Star Trek book. Just back away from the space geek money making machine, and let this be the movie that is a lasting tribute to the original creator of Star Trek, Gene Roddenberry. I realize it is sacrilege for me to say as a Star Trek fan (I’m not quite cool and knowledgeable enough to qualify as a Trekker), but there is no possible way to top this movie. I also realize that Hollywood will never kill this golden egg laying goose. And I am a hypocrite because I will be in line to buy a ticket for the next movie’s opening weekend. But the virtuous thing to do here is to walk away from the franchise while it is on top of the scifi world. This movie gives us our cocky Captain Kirk who can charm the pants off any female in the universe while deftly making decisions that saves the universe from utter destruction with just seconds to spare. It gives us a stony faced Spock struggling to suppress his emotional human side, and unaffectedly calculating everyone’s chances of survival, and managing to be an infinitely interesting character to watch on the big screen at the same time. The rest of the crew (Scotty, Sulu, Uhura, Bones, Chekov) is along for the ride. Beyond adding comedic elements to the movie, they are also a perfect balance to the diametrically opposed characters of Kirk and Spock. As a side note, being a huge Simon Pegg fan, I may be biased when I say he was the perfect choice to play Scotty. He’s totally believable as a geeky rogue engineer with equal parts brains and slovenly machismo. The movie is so good I actually missed one of the scenes I went in specifically to see. Randy Pausch, the Carnegie Mellon professor who became an internet phenomenon last year with his video “The Last Lecture,” made a cameo in the movie. He was an inspirational man who helped a lot of people face death with dignity and grace by doing so himself. He was a big Star Trek fan and talked about it in his lecture which led to J.J. Abrams inviting him to the set and shooting a scene. I totally spaced the second the film started and zeroed in on the story instead of the actors, a testament to the filmmakers’ skills. The good professor is in the film. He is in the opening scene. He even has a line, “Captain, we have visual.” Obviously, he pulled it off because I didn’t realize it was him. But no bother, my wife, who is not a scifi fan or adamant Star Trek fan, has insisted that we buy the DVD when it comes out. This is a huge endorsement for the movie because she is not really in favor of owning DVDs. Run to the theaters and see this movie. I don’t want to get too maudlin about Professor’s Pausch’s passing. I don’t know the man so it wouldn’t be appropriate for me to do a tribute to him. I was simply inspired by his courage like the rest of the world. So the best thing to do is to present him in his own words. Here he is answering 10 questions from readers of Time Magazine. Note to self: Rent Groundhog Day & Rocky, and buy Sgt. Peppers CD. The Carnegie Mellon professor who inspired the world with his tremendous attitude and will to celebrate life despite having terminal pancreatic cancer has passed away. 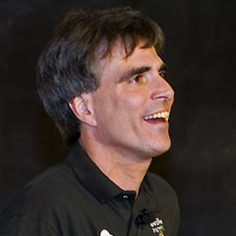 Randy Pausch entered the public arena when his “Last Lecture” was recorded in front a packed theater on the campus of Carnegie Mellon and later released on Youtube and other video sharing sites. The lecture was later turned into a bestselling book. He is survived by his wife and three children. The family requests that donations on his behalf be directed to the Pancreatic Cancer Action Network, 2141 Rosecrans Ave., Suite 7000, El Segundo, Calif. 90245, or to Carnegie Mellon’s Randy Pausch Memorial Fund, which primarily supports the university’s continued work on the Alice project. According to the WordPress stats a lot of you are still interested in Randy Pausch’s battle with cancer. I somehow have become somewhat of a clearing house of Pausch information so I feel obligated to track his progress and treatment. It’s not too much of a bother really because I was inspired by his courage as I’m sure many of you were. The latest news is not good. He is reporting on his website the cancer has spread, and that he is currently recovering from kidney and heart failure.